I’m one of those people who’s always full of layers in the Winter. I usually never leave the house without a scarf and a hat. It’s hard to imagine myself living somewhere where it’s actually cold because I’m already too cold all the time and I live in Porto. I do consider it cold but it’s not really cold compared to the temperatures of other countries, I know that! Having said that, Daniel it’s completely different, he’s walking around with his shirt, sometimes a thin sweater on top and a coat. That’s it! I’m so jealous of him for not needing 50 layers of clothes. In December, he said it was not cold enough to wear a scarf. I, on the other hand, was already super overdressed ahaha! In the beginning of last year we did discuss him having a scarf, to cover the neck and avoid getting colds, it was colder, even he could say that. So once he said he needed a scarf I started my research and found a beautiful pattern named “Men’s Interchangeable scarves” by Lorna Miser. It’s actually a collection of patterns and I went for the “Garter rib” one. I truly loved the result and it’s not really a “men’s pattern”, I’d say more unisex. You can see me wearing it and totally rocking the scarf. Daniel didn’t want to be the model so he ended up to be the photographer behind these photos of me wearing his scarf. I began the project at the end of January and finished knitting it in May. Initially I spent a lot of time frogging the project, I wasn’t liking with the texture of the project, convinced I was doing something wrong I frogged multiple times. Eventually I decided to change needles to use 3.5mm instead of 4mm and preferred the fabric with smaller needles. For this project, I used “Valeria di Roma – Merino Extra” yarn, a mix of merino wool and acrylic, super soft and very nice to knit with. I bought each ball for 6€ in “Lopo Xavier” and used 3 balls. I finished in May, definitely not time for him to wear a scarf so it ended up stored in my knitting project bag until August which was when I decided to weave in the ends and block it. I really love the end result and Daniel really likes it, it was a success! I do consider a great project for those who don’t have much experience knitting, only uses the two basic stitches (knit and purl), it’s a super easy pattern to follow (perfect to knit while watching your favorite series!). One thing to be more aware of is the texture with the 4mm needles, I didn’t like it but it’s my opinion and it also might be my way of knitting. I had to modify a little bit the pattern to work with a smaller needle and keep the same scarf width but honestly just try with the recommended needles first. 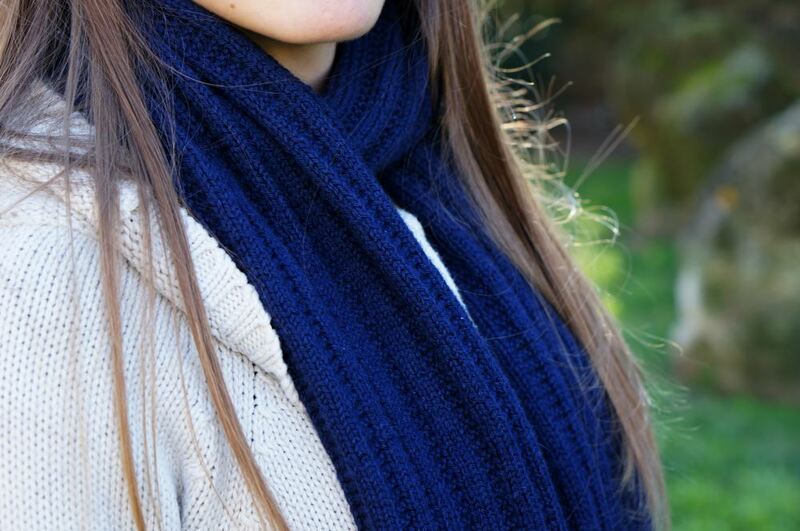 If you’re seeking an easy pattern for a scarf for yourselves or to offer as a gift, this pattern checks all the boxes! If you decide to make it based on my suggestion please let me know, I’d be happy to see it. You can see my ravelry’s project page here. Leaving you with me being goofy wearing the scarf.